I’ve never been a fan of commercial air fresheners. They smell terrible and are loaded with chemicals. So what should you do when the room needs a little refreshing? The best thing is to open the windows and let in some fresh air! Even when it’s cold, it is a good idea to open the windows periodically. So what should you do when it’s not convenient to open the windows? Keeping an open box of baking soda out in the open will help absorb some odors. If you don’t like the idea of an orange box sitting around, put the baking soda in a pretty bowl. If you have little one, it might be a good idea to put the bowl up high, so they don’t “dust” the room with the lovely white powder! Another option is to make your own air freshening spray. This is very easy and a nice way to add a pleasant scent to the room. Since essential oils are used to make this spray, it is also a nice way to boost (or calm) the mood of those in the house. Below are two air freshening room spray recipes you can make in a matter of minutes. Both may be adapted to use other essential oils. Also feel free to add more or less of these ingredients. It is not an exact science. Fill a small, 2 – 4 ounce, spray bottle with distilled water and add 80 to 100 drops of essential oil. For a calming effect use approximately 20 drops chamomile essential oil, 50 drops lavender essential oil, and 10 drops rosemary essential oil. I find the chamomile tends to overwhelm the other smells, so it might be worthwhile to start with just 10 drops and increase until you are pleased with the fragrance. 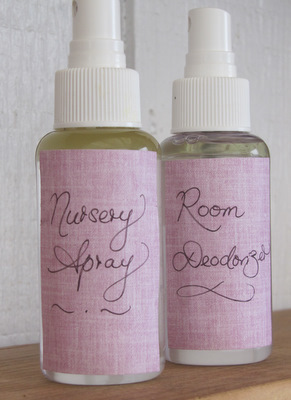 The following recipe is adapted from the Nursery Spray in Herbal Crafts by Jessie Hawkins (and excellent book). It uses a lot more oil than the previous recipe, but is not overpowering. It is my favorite spray of all. I love the combination of oils and find it very pleasant. It’s an excellent mood booster! Fill bottle will water, measure in the oils. Tighten lid and shake to blend.